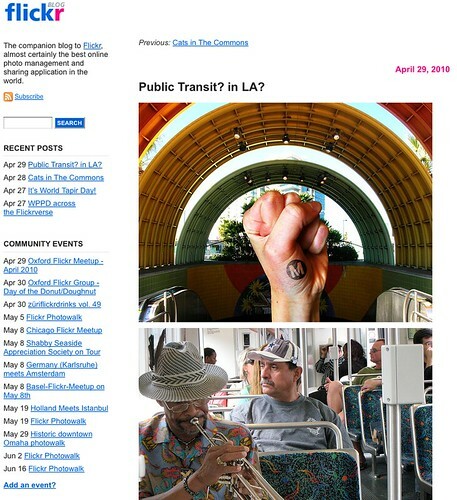 Flickr shines the spotlight on images of public transit in L.A. The popular photo sharing site Flickr runs a daily blog that highlights some of the coolest and most timely photos being uploaded to Flickr. Well today the unlikely bedfellows “public transit” and “L.A.” were the subject of Flickr’s daily update in a post entitled, “Public Transit? in LA?.” The first photo featured also happens to be a photo composite by yours truly, if I may toot my own horn. Public Transportation in LA might sound like a contradiction, but for over 25 years LA has been building a system which looks like it is coming into its own. See images of the public transit lifestyle of Angelinos in the MetroRiderLA group. Also, the Metro Library and Archive’s Photostream has fascinating images of the historic and emerging transit lines of Los Angeles. According to Alexa.com, Flickr ranks 31st worldwide and 21st in the United States in terms of web traffic – which means today’s blog post is going to introduce a lot of people to L.A.’s burgeoning public transit system. So to anyone who’s ever uploaded a photo of L.A.’s public transit system to Flickr, congrats, you’ve help change the world’s perspective of Los Angeles.